For the past 18 months or more, he has been telling those willing to listen that his game is good and that it’s just a matter of time before it all comes together. Yet while there have been sparks of golden brilliance in that time, the general colour scheme has been dark with a hint of grey. The closing 79 he shot in West Palm Beach 12 days ago was deceptive in that he got the worst of the weather on a day when Lee Westwood shot 63 and Tiger Woods a 62. Yet even as he reflected on that disastrous performance when speaking to local radio the following week, Harrington made it clear that he was patiently waiting for some confidence. His 61 was the lowest round of his professional or amateur career, though he did shoot a 61 at the 2001 Nedbank Challenge that did not count as a course record because preferred lies were in operation. 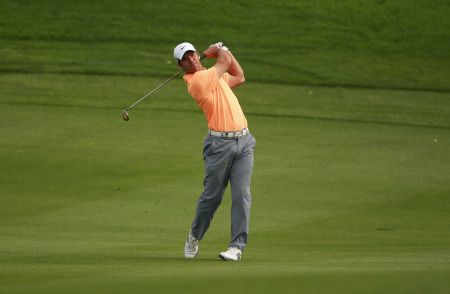 On Thursday at Innisbrook’s Copperhead course, Harrington had 10 birdies. But the key figures was 14 and 22 - 14 single putts and 22 putts in total. It was little wonder that he finished the day with a three stroke lead over Will Claxton (64). The next best scores were the 66s by Cameron Tringale, John Senden, Kenny Perry, Jason Dufner, William McGirt, Jason Bohn and Jim Furyk. World No 2 Luke Donald and Justin Rose, the recent winner of the WGC-Cadillac Championship, shot 67s. Having watched Harrington threaten to shoot 59 and then closed out his round with three straight birdies at the venemous stretch called the Snake Pit - he drained a 75 footer at the 17th for example - it was little wonder that Zach Johnson applauded the Dubliner’s 16 footer at the 18th before signing his own 71. Harrington has been around too long to get overexcited about one round and pointed to the next few weeks rather than the next few days at the real litmus test for his game. His coach Pete Cowen said just days ago that his newest pupil was going to have a huge year. We nodded, familiar with the game and the sentiment. Yet while the good was great, the average golf has been poorer than normal, especially over the short putts. 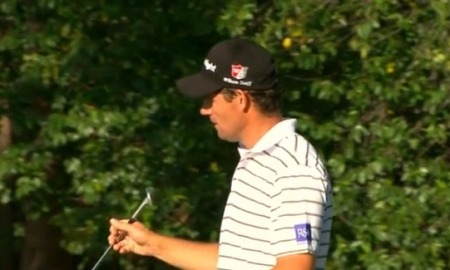 For Harrington, the sporadically poor putting has been caused by doubting his line. In other words, he was struggling for confidence, especially in tournament rounds. As a quick summary, Harrington’s assessment was pretty good. Sliding down the world rankings to 90th in the world from a high of third following his most recent PGA Tour win - the 2008 US PGA - has just made it harder. The 40-year old has had one minor win in Malaysia and another 13 top 10s in the 52 events he’s played over the past two years. He’s also missed 12 cuts and been disqualified once. Not many easy world ranking points there, unlike what was on offer at the WGC-Accenture Match Play or the WGC-Cadillac Championship, where he was conspicuous by his absence this year. Yesterday, it all came together spectacularly. But the fact that he didn’t birdie any of the three downwind par-fives makes the round all the more remarkable. No-one should be better prepared than Harrington to deal with following a huge high like a 61 with more modest fare. After all, it was winning three majors in 13 months that caused all this grief in the first place. “I won three majors, but any of the guys who have won single majors or have had a peak year, peak performance, it’s very frustrating afterwards, because if you’ve had a peak, you have to go back to the normality. That’s because the reality is not real; it would be average if it wasn’t a peak. If you have a peak, you have to go back down. But trying to explain that all the time, it’s quite tough. “I won three majors in 2007, 2008. It’s not like I was going to win two a year after that. At the end of the day, I may go on and win more majors, but if you look at any, like the likes of, say, Faldo who, has won the most majors of any European, six majors, he didn’t win them over a space of two or three years. He won them over a 20-year space, or 15, anyway. “Sports, we have this thing, especially in golf, that if somebody plays well, a lot of people think, oh, they are just going to continue to play well; they may improve, but they are going to have little ups and downs as they go along. I think that’s the greatest thing I’ve learned over 16 years of golf. 1st Par 5 560 yards 86 yard sand wedge to six feet. Birdie. 2nd Par 4 435 yards 124-yard wedge to five feet. Birdie. 6th Par 4 465 yards “Straightforward two-putt [par from 54 feet]. 8th Par 3 335 yards “Got up and down out of the bunker.” 18 inch putt. 10th Par 4 445 “I hit an 8-iron [157 yards] to about 18 feet, I would have said. Rolled that in.” Six under with eight to play. 12th Par 4 380 yards 9 iron from 148 yards to 26 feet. Seven under. 13th Par 3 175 yards 2 putts from 36 feet. 18th Par 4 445 yards. Pitching wedge 133 yards to 16 feet. It all went perfectly yesterday, but Harrington revealed that he has not been tempted to snap anyone’s head off out of frustration with his game in recent months. “I’m sure I’d be more likely to go quiet than aggressive if I got frustrated,” he said. He was frustrated not to turn his good practice round play into scores and to miss out on the World Golf Championships in Tucson and Miami over the past month for the first time in his career. But he has tried to keep things in perspective. “It’s not a wakeup call because it’s not like I could be working any harder or trying any harder,” he said. “Just have to take it on the chin really. You feel like you’re good enough, but if your performances are not good enough you have no one else to blame, as I said, with my World Ranking position. “I’m just not gathering enough points. You know, like two Top10 this is year, probably got me five points and six points or something like that, which just doesn’t cut it. You’ve got to be winning tournaments, winning the big points. Whatever he does for the next six months, Harrington knows that the good stuff is better than ever. Producing it in the heat of battle is the challenge. Padraig Harrington crashed back to planet earth in the Transitions Championship on Friday when he followed his career best 61 with a one-over 73 that betrayed some worrying frailty on the greens.